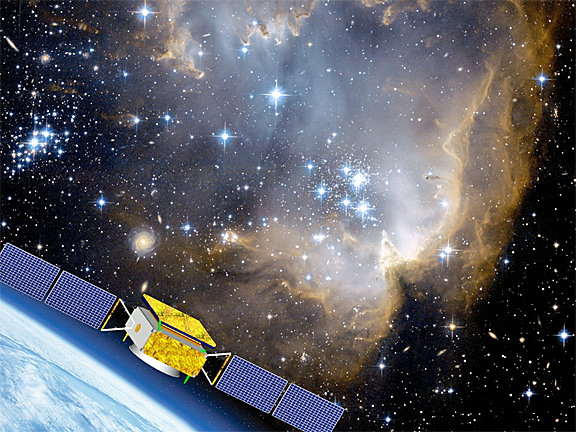 [Satnews] Xinhua is reporting that China's Dark Matter Particle Explorer (DAMPE) Satellite, which was developed by the Chinese Academy of Sciences (CAS), is expected to be launched at the Jiuquan Satellite Launch Center in mid-December. Artistic rendition of China's DAMPE satellite. DAMPE, the first satellite in a CAS space science program, and its carrier Long March 2-D rocket left Shanghai on Saturday, heading for Jiuquan in northwest China's Gansu Province.The satellite and carrier rocket are fully prepared for launch after passing the inspection and approval of the CAS. This will be the 26th mission for the Long March 2-D rocket. DAMPE is one of the first four scientific satellites employed in the CAS space program and will observe the direction, energy and electric charge of high-energy particles in space in search of dark matter. DAMPE will have the widest observation spectrum and highest energy resolution of any dark matter probe in the world. According to experts, DAMPE is designed for increased payload, with the scientific payload weighing 1,410 kg and the whole satellite weighing 1,850 kg. The design helps cut down on the size and weight of the satellite and save launching costs.